As you know, I interned at Serious Eats over the summer. What could have been three months of intimidation and thankless work turned out to be three of the best months of my life. New York itself was incredible, offering a new gem of a restaurant around every corner, so many wonderful museums, and an unrivaled energy. But I'd have to say my favorite thing about my summer in the city was working with Will Levitt and Jordan Zimmerman. Sadly, they didn't work on the same days, so they rarely got to see each other, but I was lucky enough to get to know both of them. After reading The Dorm Room Dinner, Will's amazing blog, all summer, I knew I just had to have him write a guest post. So.....here goes! The first food adventure Hayley and I ever went on, it was one of those days of summer in New York when the heat was simply unbearable. It was one of those days when you consider not getting off at your subway stop so you can stay in the air-conditioned car just a little longer. Let's just say it was hot. It was also the day Hayley and I started as interns at Serious Eats, where we would be working for the summer. And Ed Levine, the site's charismatic founder and all around expert eater, had a craving. "I think we need some donuts around here today," he proposed, "How about a dozen from Donut Planet?" Ed scanned the office, counting about seven of us. "Make it two dozen." Despite the heat, Hayley and I quickly jumped at the chance to go pick up some donuts, not wanting to miss out on any food adventures. "Before you leave," added one of the site's editors, "do me a favor. We're organizing a chocolate ice cream tasting for later this week. Do you think you guys could pick up 12 different brands of nationally available chocolate ice cream?" I'll tell you, before I go any further, that I do not like chocolate. I also do not like the heat. Hayley, who does like chocolate, isn't a huge fan of the heat either. Neither, I'll mention, is ice cream - chocolate or otherwise. From the Serious Eats office in Chinatown, we ventured out into the sun and first stopped at the Donut Planet. For those unfamiliar with this donut shop, it's like nothing you've ever seen. We looked through the glass case at flavors like Tres Leches, Blackout, Creme Brûlée, and Peanut Butter and Jelly. Then we ordered one of everything (or was it two of everything?). Success. Donuts checked off our list, we headed to get ice cream. Ice cream is usually a splendid sweet to get on a hot day, but not when you're walking twenty blocks just find the one store in lower Manhattan that sells Edy's Chocolate Ice Cream. A few hours, about seven grocery stores and a sun burn later, we returned with our chocolate ice cream, slightly melted, in hand. Success. We were starting to get an idea of what our summer might be like at this place called Serious Eats World Headquarters. If it involved donuts like these every day, I was happy. That was the first mission for Hayley and me, of which there were many more. Our summer at Serious Eats was filled with just about every type of eating you could imagine, from insane pizza and sandwiches to a string-cheese tasting and cereal flavored lip balm. Serious eating doesn't get much better than that. But Hayley and I, as if we weren't full enough from Serious Eats, also organized our eating adventures. The last food mission Hayley and I went on was to to Motorino, a popular new pizza shop in the East Village, for a farewell dinner. Like our first food mission, it was hot out (and they didn't have air conditioning!) and it involved ordering a lot of food (duh). It was the perfect way to end our summer of food, and the pizza was seriously good stuff. In honor of our last food mission, I've prepared a pizza myself. 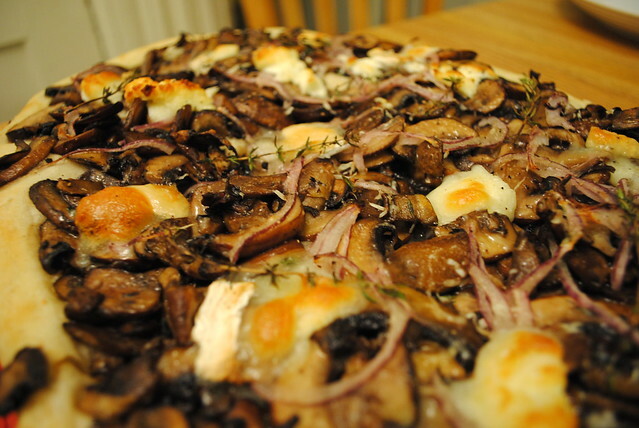 It's topped with sautéed crimini and shiitake mushrooms, thyme, parmesan and goat cheese. 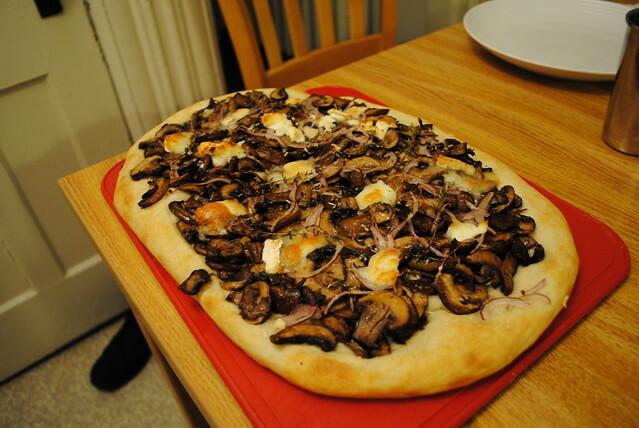 The trick to this pizza is to load it up with a lot of mushrooms, creating a hearty, flavorful base. The rest of the flavors layer just right. When you've finished all the pizza, save some room: It pairs perfectly with slightly melted chocolate ice cream and donuts for dessert. Heat the oven to 500. Brush two sheet trays (cookie sheets) with olive oil. Remove dough from bowl and divide it into two equal pieces and place one on each tray. Allow to sit, covered with plastic wrap, for 15 minutes. Using the tips of your fingers, press the dough from the center out until it covers most of the tray, about a third of an inch thick. 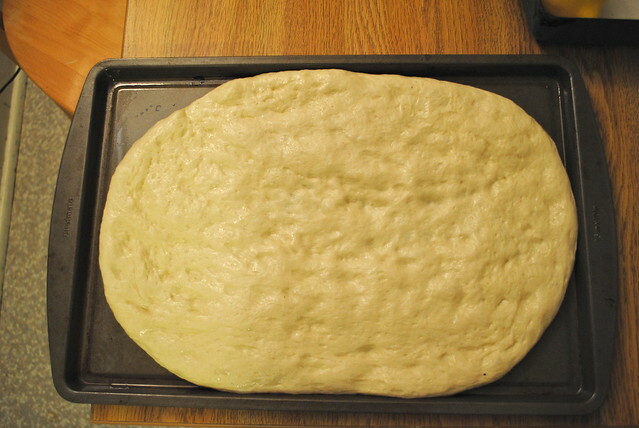 This may take a while, but be patient and don't overwork the dough (it keeps the final pizza lighter), it will eventually spread out into a large pizza. Using oiled fingers makes it easier. Cover with plastic wrap until read to use. In a large sauté pan on high heat, warm 2 tablespoons of the olive oil. 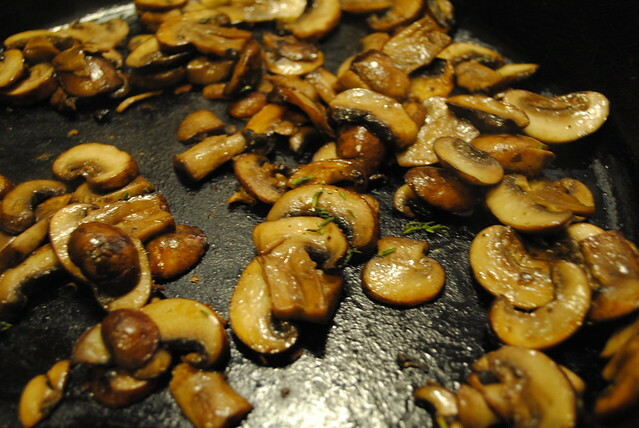 Add a quarter of the minced garlic and about a quarter of the mushrooms, not crowding the pan. Add a quarter of the thyme and season with salt and pepper. Cook until well browned, 5-7 minutes, and remove to a plate. Add another tablespoons olive oil to the pan, add another quarter of the garlic and mushrooms, and cook as before with the thyme. 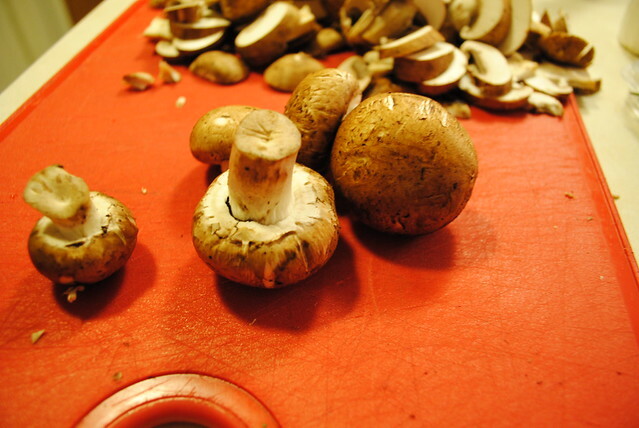 Remove and finish the mushrooms in rounds until all are cooked. 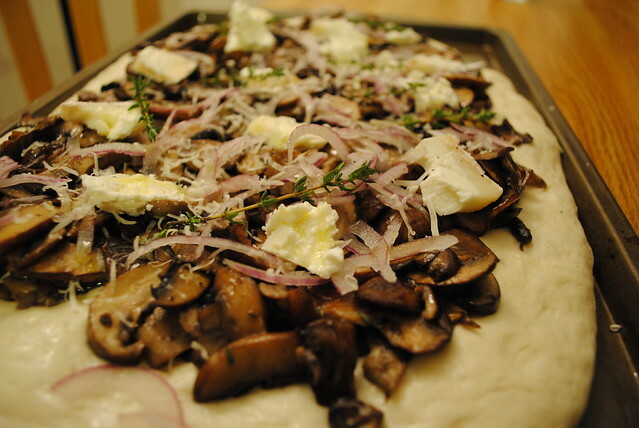 With the dough ready on two sheet trays, top each evenly with mushrooms, parmesan cheese, raw red onion and the goat cheese. Drizzle on the remaining olive oil and season with more salt and pepper. Place the pizzas in the oven and bake for 10-15 minutes until the cheese is fully melted and the crust is lightly brown. Serve at once. In a small bowl, combine yeast, water, honey and olive oil. Allow to sit until it begins to bubble or foam, indicating that the yeast is active, about 5 minutes. In a large mixing bowl, combine the flour and salt. Make a well in the center of the flour and pour in the yeast mixture. Combine with a wooden spoon or your hand until it comes together into a dough. You may need to add more flour or water. Turn dough onto a surface and knead until a smooth ball forms. Rub a large glass bowl with olive oil and place the dough inside. Cover with plastic wrap and place in a warm spot for 1-2 hours until the dough has doubled. Note: For maximum flavor, allow the dough to rise for half an hour at room temperature, and then place in the fridge over night. Remove from fridge one hour before baking the pizza. this food makes me wonder, "why would i ever not eat something healthy and fresh." so tasty. the other thing i like about his recipe is that it is a method. if you can get wild mushrooms, a have an herb in surplus other than these it will still work. great job on this post hayley. wanted to add that part of the success of this is the little things. like slicing the onions super thin. every little thing brings the finish product to something amazing, instead of "just another pizza." I totally agree. Will did such a wonderful job! I am a HUGE mushroom fan and I actually usually only want mushrooms on my pizza, but the rest of the group never does. I'll have to make this for myself! Also, I am extremely jealous that you guys got an internship with serious eats. I am currently looking for one summer 2012. How did you get this internship and was it a paid internship? You definitely should. It is delicious!